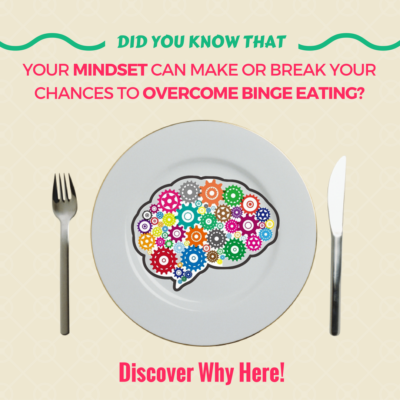 Did you know that your mindset can make or break your chances to overcome binge eating? And if you’ve been struggling with food for several years, only to grow more worried and desperate, there’s a 90% chance that you need a mindset makeover. If you just can’t wait to discover how to change your mindset so that you never have to worry about food for the rest of your life, click here now to get a free cheat sheet and an explanatory video on how to do that. Here’s a common scenario: You binge and shortly after that you make promises that you’ll start over next week and resolve your eating problem then. Except that it’s the 200th time you’ve told yourself that, and then the next week nothing changes. Or maybe there are moments when you start feeling that you’ve got this under control. But one single bite snowballs into a series of binges and you’re not always sure what started it. Each binge leaves you feeling more powerless and doubtful of you chances to recover. The most extreme case is when binge eating becomes the norm because you feel it would be too painful to let go of food. So how do you overcome binge eating permanently, even if you have been addicted to food for decades? Whenever you are trying to learn a new a skill or build a million dollar business or change a habit, the way you react to setbacks is going to determine your success. And Richard Branson, the one who created all the Virgin companies (Virgin Airlines, Virgin radio, Virgin Cola, and Virgin mobile) has a lot to teach us in that field. And failed, he did. Virgin Colas, Virgin Vie, Virgin Brides, Virgin Vodkas, and Virgin Clothings are now all history. Everybody, and especially every entrepreneur, should embrace failure with open arms. It is only through failure that we learn. Now that’s exciting! But you may be wondering: “what does this have to do with binge eating?” And I’ll tell you in a sec. So, what Sir Richard Branson says is that a setback is just a learning experience. It doesn’t define you, it doesn`t tag you as a failure, and it doesn`t predict your future. Even a handicap doesn’t mean you can’t have what you want in life. So how does this apply to overcoming binge eating? Now let me ask you: how do you define success and failure when it comes to eating? What I often hear is that success means eating a little of everything, even some of the “kryptonite” foods with balance, and maintaining a weight and body you’re comfortable in without ever having to worry about food again. If this seems like an exciting outcome, then read on. Because you’re about to discover the one mindset shift that will bring you success. she is curious about discovering new ways to recover and actively researches them. she no longer cries or freaks out when she sees that she has gained weight on the scale. she doesn’t bash herself or conclude she’s weak or lacks discipline after a binge. As a result, she is much more relaxed, much more appeased, and her faith in her recovery has soared and is 60-70% superior to most women who contact me. Who wouldn’t want 60% more peace with food on a daily basis? If this is what you have been secretly begging for, hang on. It’s coming to you. Why Having a Fixed Mindset Will Kill Your Chances to Recover in the Nest? Now that I have been hinting about the qualities of a growth mindset, let me cover the pitfalls associated with a fixed mindset. The concept of growth mindset was devised by Stanford University psychologist, Carol Dweck, who focused her research on achievement and success. She studied how children reacted in a challenging education environment and discovered the concept of mindset. If you’ve read my previous story on How to Stop Binging: The Secret Key to Normal Eating, you know the disastrous effects and some of the roots of this kind of thinking. I’ll let you notice the words “ALL THE TIME” and “NEVER” in Dweck’s quote. For the sake of this presentation, I will call this the ALWAYS or NEVER set. ALWAYS or NEVER thoughts are usually accompanied by the ALL or NOTHING idea. When you think in those terms, your future or outcome is always fixed; It’s either or. But progress doesn’t matter. So a fixed mindset thinks in ALWAYS or NEVER and ALL or NOTHING terms. You enter the NOTHING zone when you’re eating is imperfect. NOTHING is eating with no restraint at all. 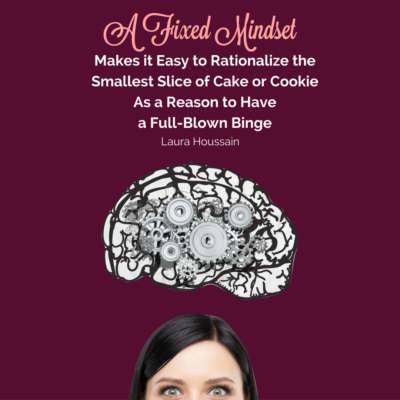 So a fixed mindset makes it easy to rationalize the smallest slice of cake or cookie as a reason to have a full-blown binge. And because every setback is so detrimental to your sense of self-esteem and self-worth, because of the ALWAYS or NEVER concept, you may feel scared to try anything new or may lose motivation entirely after a few failed attempts. This mindset can lead to apathy, but also putting yourself under so much pressure that you just want to give up, to shut up this food chatter in your head… and binge to get it over with. And because your sense of core value can be so easily crushed, any criticism is a threat to your well-being. You may even fear going out, meeting new people, going on dates, or applying for a challenging job because these situations may lead to the crushing feeling that you will NEVER succeed or that you amount to NOTHING. Because a flick of a switch can destroy your self-esteem. And instead of rallying a dozen of your friends who eat and look like you would love to and let them become your devoted guides and mentors, you’d rather protect yourself from the shame of feeling inferior to them and keep your eating disorder to yourself. To me, a fixed-mindset is a sophisticated explanation for perfectionism combined with lack of self-acceptance and self-esteem. You may have different mindsets for different situations. For example, some people can have a fixed mindset for relationships and a growth mindset for work. Others have a fixed mindset for everything. 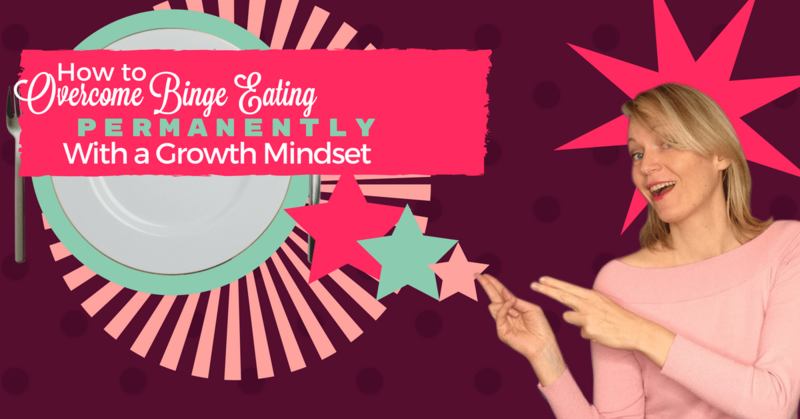 How A Growth Mindset Can Help You Overcome Binge Eating and Transform Your Relationship With Food For the Rest of Your Life! I promised I would tell you how Sir Richard Branson’s pearls of wisdom would help you stop binge eating. Now is the time I to tell you how. When I read his book, Losing My Virginity, I realized this man had the kind of thinking I needed to put in my head to attain my goals. I also felt like I could never be like him. But now I understand that what he has is a growth mindset and while not everyone can achieve what he has, at least anyone can develop and enjoy the benefits of a growth mindset — including you and me. How to Discover What Kind of Mindset You Have When it Comes to Food and Eating? “Use Challenges to Adapt, Revise, and Re-Adjust Your Approach” turns into Use Cravings, Food obsessions, Weight-Gains, and Binges to Adapt, Revise, and Re-adjust Your Approach. Carol Dweck, adds that people with a growth-mindset love challenges — the bigger the better — persist in the face of adversity, learn from criticism, see effort as a path to mastery, feel inspired by other people’s success. Now I want you to assess your mindset. You may feel like you have a growth mindset because you have tried several diets or hired a nutritionist. But, to me, trying to fix binge eating by controlling the way you eat is just one approach. So even if you are a thriving, highly-disciplined, strong-willed woman, what matters is how curious and excited you are to try radically different approaches and how you react to setbacks and challenges. So what have you tried? Distracting yourself, rebounding, meditating, yoga, therapy? Have you looked for an ideal combination? How did you assess success? Did you give up easily when it was hard? How do you feel about yourself after a binge? What do you think about your future after overeating? The answer to these questions will tell you in which type of mindset you have. If you fear your mindset is keeping you stuck, secure yourself a free copy of my plan to overcome binge eating permanently by building a growth mindset so that you fast-forward your recovery days to as little as very short three months and find peace with food without strain or struggle. But now you may be wondering…. OK. I know I have a mindset problem. How do I change it? 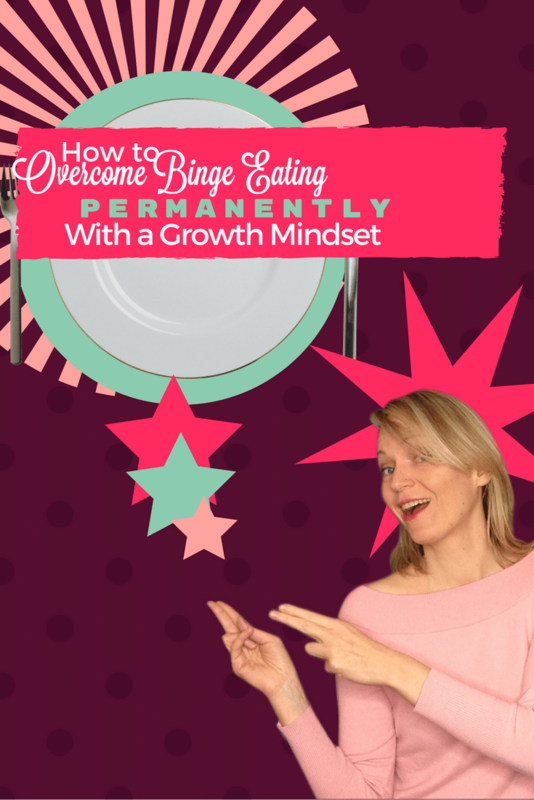 How Do You Change Your Mindset to Permanently Overcome Binge Eating? The first step is to observe your mindset as it is today. The second step is to build a safe space for growth. The third step is to radically change the way you evaluate success. The fourth step is to build faith in your ability to recover. The fifth step is removing internal blocks to recovery. The sixth step is to change what you expect from yourself. So, if you accept that there are steps, you are OK with making mistakes, you make realistic expectations and adapt and refine your approach along the way, you will overcome binge eating in time. These are the qualities of a growth mindset. And the framework of a growth mindset is unshakable self-acceptance. If you accept yourself even when you make a mistake, when people around you criticize you, or when they seem more successful than you, then taking on big challenges will not crush your heart. Binges and cravings will become exciting opportunities for learning and self-discovery. Click here if you want instant access to a cheat sheet with all the steps to build a growth mindset and a video explanation on how to do it to recover from binge eating forever. It’s possible to change any habit gracefully with a growth mindset. It’s thoughts with an ALWAYS/NEVER or ALL/NOTHING dichotomy that keeps us afraid of trying new things and tempts us to play it safe with old approaches like dieting even if we are now convinced that they don’t work. To overcome binge eating permanently we need to switch from a fixed mindset to a growth mindset in order to build enough patience, peace of mind, and sustain our motivation and perseverance over time. And the framework of a growth mindset is unconditional self-acceptance.